Following on from my Won’t Read, Can’t Read blogs, I wanted to further examine the reasons why many of our students are unable to read. However, this time I wanted to make it very personal, and walk you through my own training as a teacher in the UK in the 1980s, and why this didn’t prepare me for the task of teaching children to read. I have also learned from the many conversations I have had with teachers in the USA, whose experience has been very similar to my own. Just recently I took myself on a journey down Memory Lane as I read through my college reading file (yes, I still have it after 33 years!) for the first time since I left college. It says a lot about how (not) helpful it was, that I didn’t turn to it once in my entire first year of teaching! So what exactly did I learn, in what should have been the most important course of my teacher training and B.Ed degree? I shall detail that here, but more importantly I will discuss what was missing, and what was known about at the time in the science-of-reading community. Sadly, this science had little impact on teacher training then and still has little impact today. After leaving college, I learned about effective ways to teach reading from other teachers, from my own teaching experiences, and by reading widely. 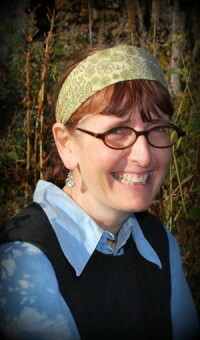 I was also in the very fortunate position, in the late 1980s, of being accepted on a Certificate of Professional Practice course: “Teaching Children with Reading and Writing Difficulties/Dyslexia.” I was only in my second year of teaching, so I was more fortunate than Su Williams, who struggled for seventeen years to discover how to help her struggling readers. It was during this two year training course, that I was mentored by the late Jean Augur, then Education Director of the British Dyslexia Association. Through this training, I learned how I could help my students with dyslexia; I also discovered that I was dyslexic! I’m sure you are wondering what my college reading file included, and what the second year of my Bachelor of Education course actually did teach about reading, so here we go. My italics indicate where current science or my experience contradicts what I was taught. 3. Children will fail to learn to read who do not want to read! “Really?” I’ve yet to meet a child starting school who isn’t excited to learn to read! 4. We learned about The Three Cueing System, Cloze Procedure (deleting every tenth word and having the child fill in a word that makes sense,) and the Psycholinguistic Model of the Reading Process. a. Language-Experience: Where a child’s own words are used to help them to read. b. Whole Language: Where the emphasis is on meaning and strategy instruction. c. Look and Say, and Phonics, both of which place emphasis on isolated words and, in the case of phonics, breaking words into individual sounds or syllables. This phonics approach was rarely taught systematically and was more about getting children to “sound out” when they got stuck on a word. We were taught the pros and cons of each approach. I explain later, using a Marcia Henry quote, why these models and approaches don’t work. We heard too, about a few reading schemes based on these approaches. In my experience, none were effective in teaching children with learning difficulties to read. 6. A child will learn to read when he or she is ready (also called Reading Readiness); the teachers task is to create rich literacy environments that will start a child on their reading journey. I learned just how important my role was, when working with children with learning difficulties. 8. We also learned to develop comprehension questions based on Barrett’s Taxonomy of Comprehension. I still use this today! I create literal, reorganizational, inferential, evaluative, and word meaning questions based on a text being covered by a student. 9. We had one class on reading difficulties and the large range of possible causes of reading problems, although details of these weren’t included. We also heard about standardized reading tests, but not in any real detail. We were taught that reading difficulties could be the result of a psychological or physical incapacity, or caused by inappropriate teaching methods. Inappropriate teaching methods are the reason most children with learning difficulties don’t learn to read! Dyslexia was covered in just three sentences, none of which included any kind of definition. I have read numerous books about dyslexia, heard many professionals that have specialized in this field, and attended conferences whose only purpose has been to convey the latest research and ideas about this condition! It has been a lifetime of learning, but I so wish it had started as a result of my college education. 10. We learned how to create a rich and stimulating reading environment, and how to develop a child’s comprehension skills. I did all that, but it wasn’t enough to help my struggling students. Whole-language instruction assumes that through exposure to good literature and opportunities to read and write, children will pick up the alphabetic code and make their own phonics generalizations. In the whole-language approach, any phonics instruction is embedded in “real” predictable text. Unfamiliar words are to be guessed from the context, not sounded out. Stanovich and his colleagues (Stanovich, West & Freeman, 1981; West & Stanovich, 1978) found that reading was not a “psycholinguistic guessing game” as proposed by Goodman (1967, 1976); but rather, only poor readers guess words from context, whereas good readers do not. Stanovich inferred that skilled readers did not need to rely on context information because their word recognition processing was so rapid and automatic. So what was missing from my reading course? Well, just about everything I needed to know to teach children to read. Comprehension is the ultimate goal of reading, but there are many foundational skills necessary for comprehension to occur. 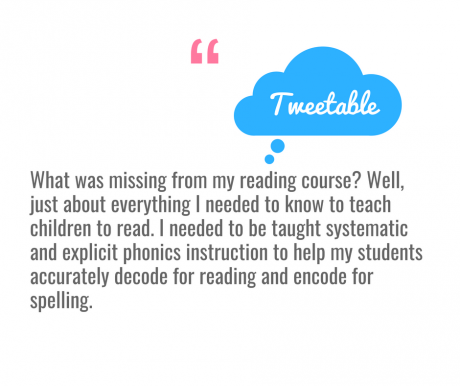 I needed to be taught about systematic and explicit phonics instruction for reading and written language, in order to help students decode for reading and encode for spelling. In fact, I needed instruction in the “Big Five”: Phonological and Phonemic Awareness, Decoding, Fluency, Vocabulary, and Comprehension. During the 1980s, knowledge of these areas was being developed by researchers, but little was finding its way into teacher preparation and training, and sadly that is still the case today. My next blog will be, “Why Can’t All Our Students Read?…The Solutions” and will discuss what we as educators and parents can do to inform ourselves and help our struggling readers. ● Podclassed Part 1-Are Educators Being Adequately Prepared for the Challenges of Teaching Reading? Finally, here are two great resources for teachers, tutors, and parents to build the knowledge and skills they need to teach all their students the two foundational skills of phonological and phonemic awareness and decoding. Future blogs will discuss the “Big Five” in more detail and provide resources. For teaching phonemic awareness and fluent word recognition skills, to both younger and older students, I recommend the program “Equipped for Reading Success,” by David A. Kilpatrick, Ph.D. The Orton-Gillingham Online Academy provide their Level 1 Basic Language Course, to train teachers, tutors, and parents to meet the needs of students with poor phonic skills. 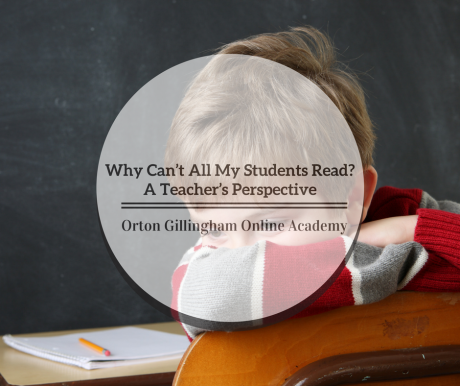 The Orton-Gillingham Approach and programs based on this approach can be used to teach all children to read. 2. Mark Seidenberg. Language at the Speed of Sight: How We Read, Why So Many Can’t, and What Can Be Done About It. 7. Jean Augur’s obituary in The Independent. 8. 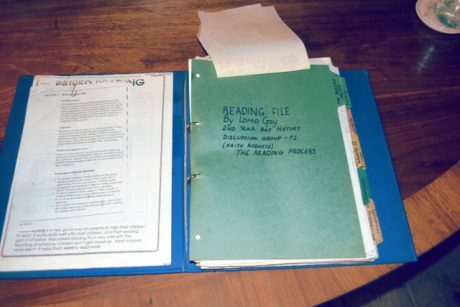 My Reading File Created at Bath College of Higher Education in 1984-1985.